"Your product AQURON has certainly met its specification"
"We are totally satisfied with the performance of the product AQURON, and would recommend it highly where an effective ecomonical treatment to seal off concrete from the effects of porosity is required"
Yours have been the only sealers that have worked in a long procession of sealers"
"AQURON was used on all slabs at the project in Onehunga. Some of these were post tensioned and some traditionally reinforced. The product was professionally applied and not one slab showed any sign of cracking. In one cast steel UB posts were cast around and no sign of cracking around these is evident some 4 months later. Further to this the visual effect on the slabs was far preferable to the usual membrane curing compounds. There was no sign of the usual crazing effect of over application and once dry, no slippery surface effect which made for a safer floor to work on. On future projects it will be my clear choice of curing compounds"
"..We have always been satisfied with the results & consequently continue to use AQURON 2000 extensively throughout our construction divisions. 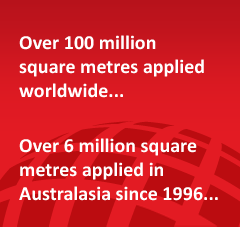 We have used AQURON both in high hydrostatic pressure & also simply as a curing compound. We frequently use where floor coverings are required to be laid quickly after slab curing"
"I highly recommend AQURON 2000 as a sealer, hardener, and curing compound"
"Since 1996 our company has progressively built in excess of 50000m2 of warehousing. All the floors have been constructed of concrete between 150 and 200 cms thickness using steel fibre as reinforcing and finished with AQURON to seal and cure the concrete. 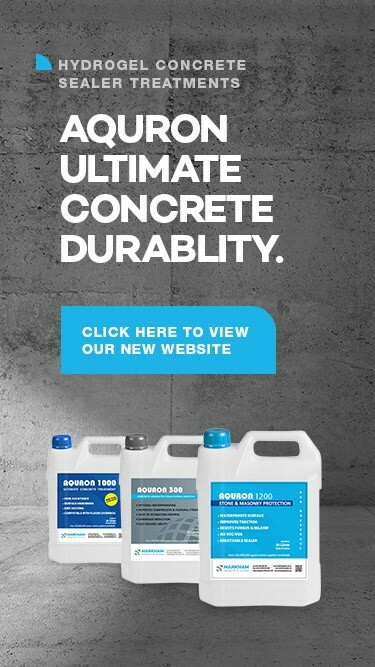 We have been completely satisfied with the strength and durability of the concrete floor which in many areas take a heavy work load both in weights and traffic flow. We will have no hesitation in using this product for the future warehouse developments we are planning for the future"
".We confirm AQURON 2000 was used to seal the concrete surface before application of vinyl and carpet floor coverings - We would use it again"
"..We tried numerous ways of solving the problem, unsuccessfully. At the suggestion of the building inspector we contacted you. About a week after the AQURON treatment the home owner was able to relay the carpet, and two years later has not had any recurring dampness." "We are pleased to inform you of our satisfaction with your AQURON concrete treatment"
Auto Service Centre - USA. "AQURON 2000 was utilised in our new showroom/bulkstore of 1000m2 which was built in 1998, no DPC or other vapourproofing was used except AQURON 2000 which vapour/moisutre proofed our concrete, this included areas of floor coverings. I am very pleased with the result."